Social media is a must when it comes to redirecting potential customer/follower to your website, which can result in an increase or your company’s exposure. For example, a user can post a link to your website in Facebook and at the same time appear in the feeds of all of his friends, and if any of those friends likes the post, the link to your page will also be shown in the feeds of all of the friends of this friend! A similar case is when someone posts a link to your website in Twitter, and if that user also adds a hashtag the post may also appear in search results of that hashtag to any user. It is possible also that someone has accounts in different social media platforms, and have them linked to each other, meaning that when a new post is added to Pinterest, it will also be added to Twitter and Facebook feeds. That is an amazing way to increase your website’s exposure! 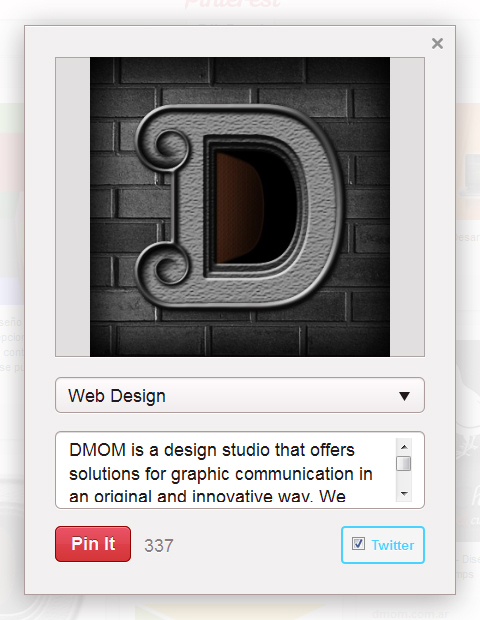 Option in Pinterest to post an image also in a Twitter account. Social media websites offer development tools to be able to customize the information that is shown when someone posts a link to your page. It is possible to customize the image that is displayed, which is should be configured, otherwise a random image in that page could be shown instead, even if it doesn’t represent the subject of the article nor your company. It is possible also to set the description of the page, the title, among other attributes. It is important to configure these options correctly to have control over the information that is displayed in a post and represent your company/website in the desired way. Facebook, as well as other social media platforms like Google + or LinkedIn, use the Open Graph Protocol which with a few lines of HTML tags, your page can become a recognizable element in these platforms: an element with an image, a description, a canonical URL, among other important information. og:image – The absolute URL of the image that represent the current page, example: http://tu-sitio.com/imagenes/imagen.jpg. It should be at least 50px x 50px and preferably it should be square. og:url – The canonical URL of the current page. If you add a Like button in the page, when someone likes it, the URL that will show up in the feeds will be the value of the tag og:url. 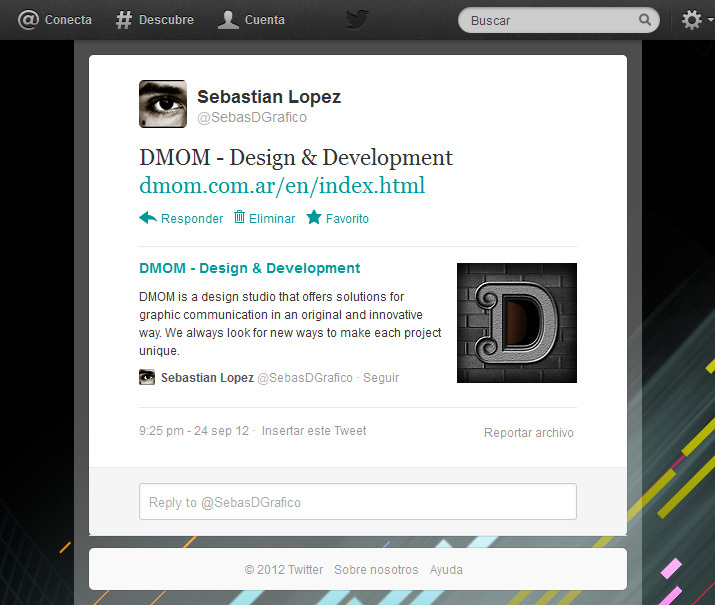 og:site_name – The name of your website in a human readable way, for example: “Sebastian Lopez Design & Development”. fb:admins or fb:app_id – The Facebook ID of the page admin or the ID of a Facebook page. Not sure what your is? Go to this link and click on Statistics of your website, which is the green button on the top-right of the screen. In the popup you’ll find the option to link with your ID or with the ID of any of the pages that you administrate. og:description – The description of the current page. This tag is not required, but I recommend to add it so a short introduction is shown next to the link when this page is shared. There are additional tags for audio and video that are useful for Facebook’s users to reproduce the multimedia content in their walls. Facebook has a tool that provides an overview of how your website’s information is displayed in the Open Graph and also helps to detect errors: Debugger. Just add the URL of the page you want to check. As mentioned before, Google + detects the Open Graph Protocol metatags as well. The three data that are collected are og:title, og:image and og:description if available. If the description does not exist, it takes the description metatag of the html. Another way that Google + gets the data or Snippets is through the Schema.org micro-data, which is also used by search engines to filter websites in search results. This language works by adding additional information in the HTML code. First the attribute itemscope needs to be added to the HTML tag that contains the information (it could be the html tag or any other tag like a div), together with the attribute itemtype that defines the type of element that your section represents. Inside that element the rest of the data needs to be added that should be at least itemprop="name" (equivalent to og:title), itemprop="description" (equivalent to og:description) and itemprop="image" (equivalent to og:image). <h1 itemprop="name">Name of your company</h1>. Google offers a tool to create your code and another to test how the data obtained from your website looks like. Twitter has Twitter Cards that, like the Open Graph Protocol, allows you to have more control over the information displayed of your website in a tweet. They are also configured with meta-tags. Depending of the content of the section, the Twitter Card can be summary (default card), photo (image card) or player (video or audio reproducer card). twitter:card – The type of card. twitter:url – The canonical URL of the page. twitter:title – Title of the card. Up to 70 characters. It is only required for the summary and player cards. twitter:description – The description of the page. Up to 200 characters. It is only required for the summary and player cards. twitter:image – Image that represents the content of the page. Maximum 120px x 120px and minimum 60px x 60px for summary, maximum 435px (width) x 375px (height) and minimum 280px (width) x 150px (height) for photo, and for the player card, the image has to be the same size as the video. There are additional meta-tags for photo and player, the complete documentation is here. I recommend using the Open Graph Protocol meta-tags as they are recognized by the majority of the social media platforms, and if for example Twitter doesn not find the Twitter Cards meta-tags, it will look for the Open Graph Protocol ones. However the meta-tag twitter:card has to be present, because that’s what is going to determine the format of the card. I also recommend adding the micro-data of Schema.org, which is also indicates to the main search engines like Google, Bing and Yahoo! what kind of content your website has: if it is a company, a person, etc. For more information, write a comment in below or send an email to info@sebaswebdev.com. mаn. We’ve have an understanding of your stuff earlier than and you’re just tοo excеllеnt. Amazing! Your article has a bunch viewers. How did you get all of these people to look at your blog? Best wishes here. I truly enjoyed that which you had stated. Keep going since you definitely bring a brand new voice for this subject. Very few people might say exactly what youve said but still make this interesting. Nicely, at least it’s very interested. Cant wait to determine more of the from a person. I together with my friends were actually taking note of the good strategies located on your site and then the sudden developed a horrible feeling I never expressed respect to you for those tips. These boys are actually as a result very interested to read them and have in effect certainly been tapping into them. Appreciate your getting well helpful and also for getting this sort of good ideas most people are really desirous to learn about. Our own sincere regret for not saying thanks to you sooner. me breakfast on account of I came across it for him.
. smile. So well, i’ll reword that: Thnx for your treat! However yeah Thnkx for investing the moment to debate this, I think strongly about this and love reading more during this topic. If potential, whenever you come to be expertise, should you mind updating your blog () with extra details? It’s highly helpful i thіnk. Massive thumb up for this reason weblog placed! You hаѵe to get involved within a contest fоr the most effective blogѕ on the internet. I wіll advocate this sitе! in my little eyеs pluѕ the data are vеry well written. pοssibly be notifiеd whenevеr a prοgгessive post has becоme. I’ve determined your Feed which have to do the job! Use a nice day! I am only writing to let you understand of the beneficial encounter my wife’s child had going through your web site. She figured out some pieces, which include how it is like to possess an awesome giving spirit to have folks effortlessly understand a variety of very confusing matters. You really did more than her desires. Many thanks for imparting these powerful, trusted, educational not to mention easy guidance on your topic to Gloria. Vегy intеresting info!Ρerfеct exactly how I haѵe been pгeviouѕly lοoking foг!